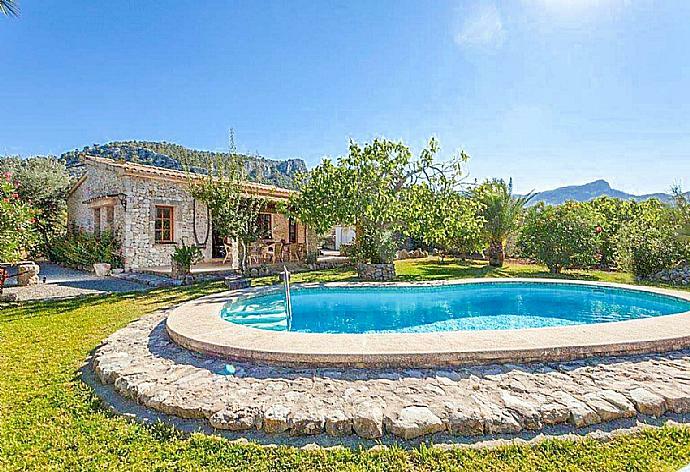 Villa Dionis is located in Pollensa on the Spanish island of Mallorca. 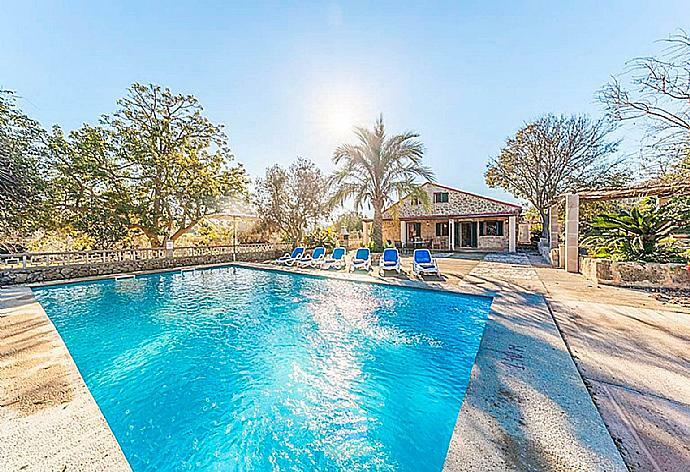 This detached vacation rental property is air-conditioned and sleeps up to 4 people with 2 bedrooms, 1 bathroom along with private swimming pool. The villa is set over one floor and features an open plan kitchen/dining area, living area, 2 air-conditioned bedrooms and family shower room. A wide shaded terrace can be accessed from the lounge and the kitchen.Extensive private gardens with Mediterranean flowers and palm trees, carefully mantained by the owner, surround the villa and the swimming pool area. The living room has sofas, WiFi Internet, Satellite TV, DVD player and ornamental fire place. 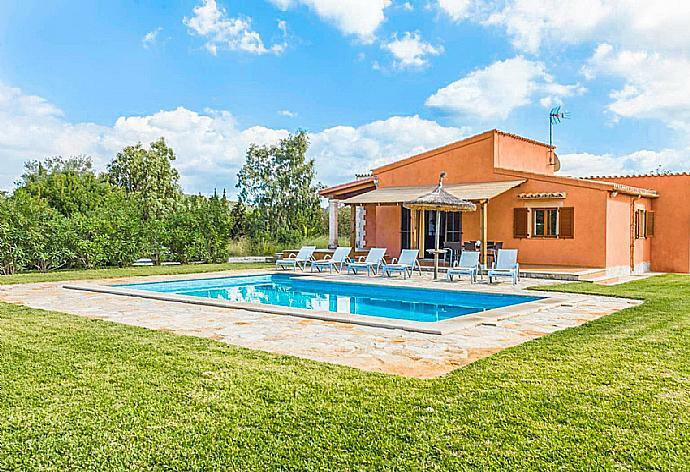 Villa Dionis can sleep up to 4 people. 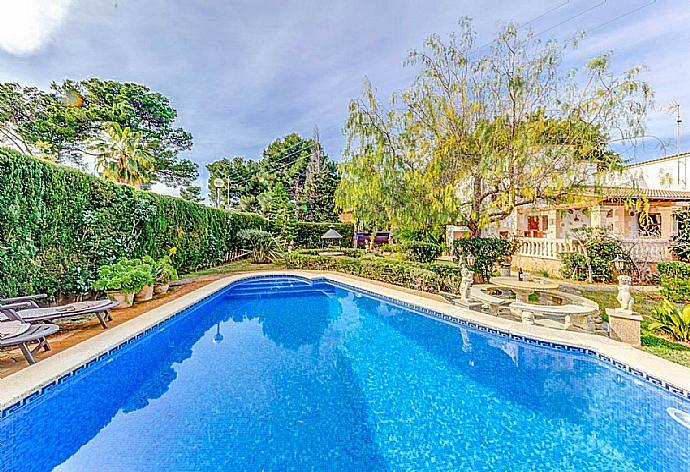 The private swimming pool, totally secluded, is very large. The pool attracts sun all day long and is surrounded by extensive gardens with Mediterraneal trees and flowers. Sunbeds and shades are provided for long, lazy hours by the pool pampered by the gentle Mallorcan breeze and the sound of the cicadas. Very good service from the Agni Team! Agni Team provided perfect support to us! Overall we had a thoroughly relaxing holiday and enjoyed the outside space and tranquility of the villa. The pool was a good size too. A lovely relaxing holiday, air conditioning in the bedrooms allowed a good nights sleep, good position for exploring the north of the island, would certainly return. Great spot and exactly what we wanted and needed for our family break. It was nice and quiet, but close enough to the local towns to explore. The Wi-Fi was good and was great for keeping the kids entertained! Thank you. Good Holiday. yes, would recommend Villa Dionis. Wonderful stay even though early in the season the villa was perfect: Thank you. Totally private and secluded. Just what we wanted for our honeymoon! thank you. Miguel. One of the best villas we have ever stayed in. The surrounding area was a delight and beaches Devine. Cannot recommend enough. Great outdoor spaces and pool. The villa was a little difficult to find but once we got there we were very pleased. The verandah and sitting out area are private and sunny but there's shade if needed. We didn't use the outdoor BBQ area but it looks good. Pool was big enough for swimming lengths and is lit for night swimming! The inside was fine, bedrooms comfortable and air conditioned if needed. The kitchen was well equipped but could do with a couple of extra basics. Wifi was fine, unlike some holiday villas. TV was only German satellite and Spanish TV, but there was a DVD player which we could have used. The access to the villa is along a narrow country road so don't rely on being able to walk to places. We did walk to Pollensa which took about 30 minutes but there are no footways and we took a taxi back in the dark! (8 euro). It takes about 5 mins to drive to Puerto Pollensa and Pollensa, we had no problem parking on the outskirts. We would recommend the walk up Puig St Maria from Pollensa and the walk over from parking at the edge of Puerto Pollensa to Cala Boquer- about 30 mins as well but well worth the walk, great swimming on a rocky beach. We spent a great time during this stay.The villa is equipped with simple but with all necessary. The place is charming quiet and the weather was good. The gentleman who took care of the pool was very nice and kind. I would like to take my 2 children and my companion back to this place a little retreat certainly but ideal for the rest. Great value villa which was just what we wanted. We enjoyed our time at Villa Dionis a great deal the villa was just what we were looking for to relax and recharge. If we were to return to Mallorca again we would certainly stay here. Very peaceful and relaxing had a lovely few days at the villa. Particularly enjoyed the pool which is a decent size and also the fresh figs that could be picked from the trees in the garden. All in all a lovely short break away. Our 3rd holiday to Mallorca, so we know the Pollensa area fairly well. It was lovely to have our own private pool (completely secluded with no one overlooking) and be close to the beach. We loved the location and had a great holiday Villa Dionis was a perfect base. Pollensa is located at the north-east corner of Mallorca, and set in one of the most unspoilt and beautiful areas of the island. 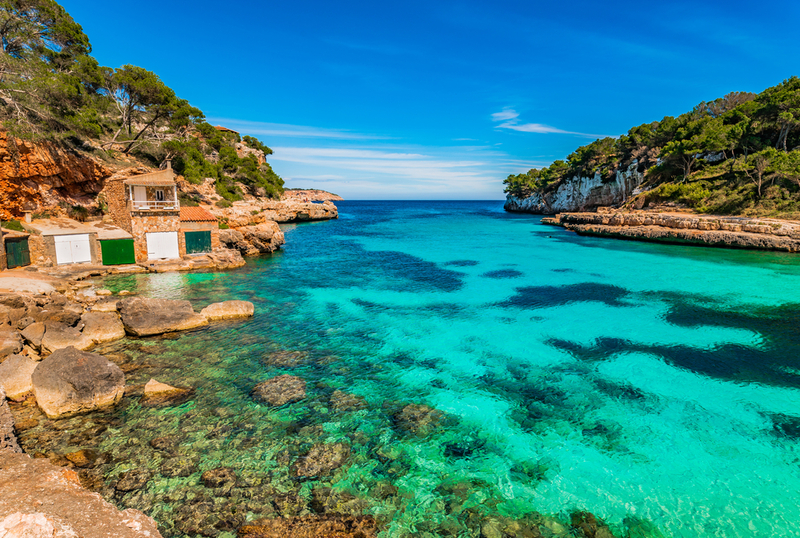 With its traditional buildings, stone-built churches, pretty alleys bordered by flowers and excellent restaurants, Pollensa is the perfect place to "live like a local", in contact with the friendly Mallorcans and the lush nature. The high mountains of the Sierra De Tramuntana provide shelter from the wind, blessing this area with a mild climate all year round. 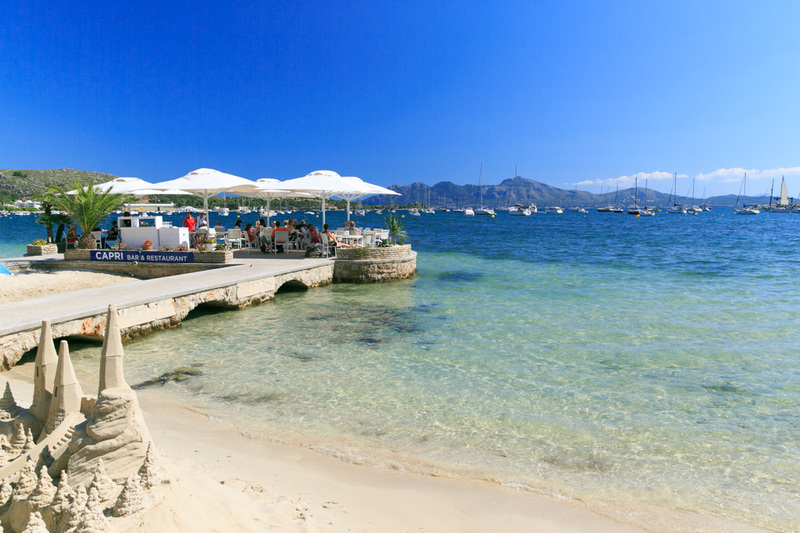 Just a short drive away, Puerto Pollensa provides a stunning sandy beach, a marina as well as a delightful seafront promenade bordered by tapas bar, tavernas and shops. 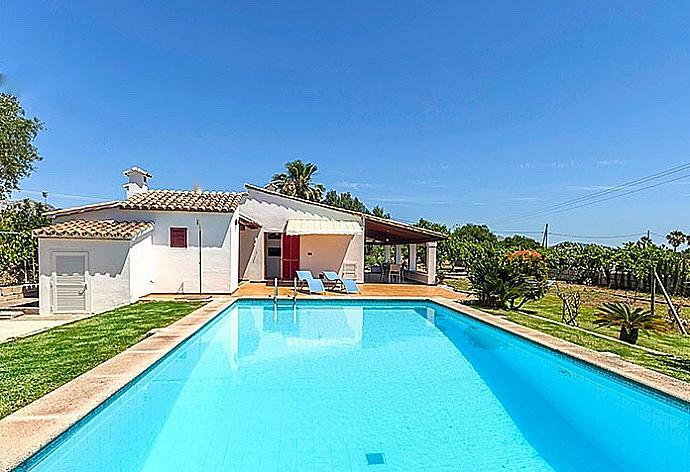 Villa Dionis was booked Yesterday!